Raspberries, blueberries, redcurrants, cherries... 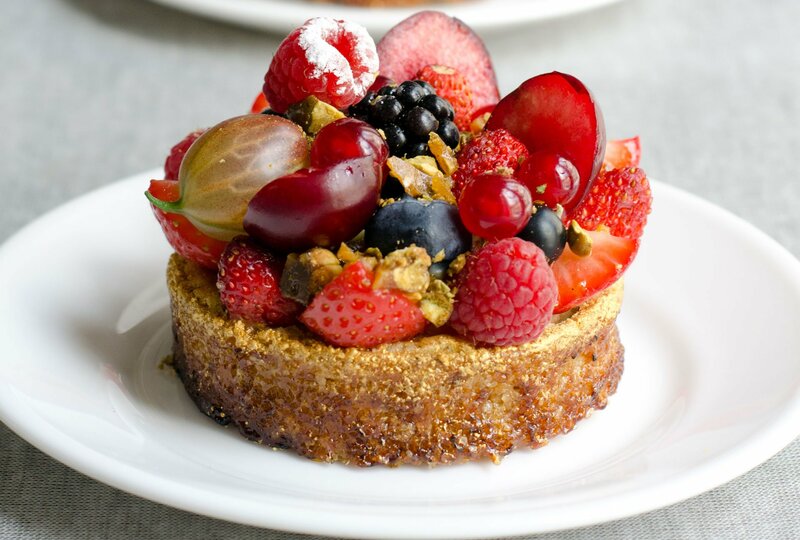 Le Cordon Bleu Chefs have chosen a tartlet recipe that showcases red berries, which are abundant in France during the summer months. Accompanied by a classic almond cream, and a fresh lemon and mint cream, these remarkable tartlets are ideal for dessert or afternoon tea. Preheat the oven to 150°C. Roll the dough out to a thickness of 3 mm and cut out 8 cm diameter circles. Line the tartlet molds. Bake for 35 to 40 minutes, until completely cooked. Leave the oven on. Cream the butter with the sugar. Add the egg, mixing well. Add the ground almonds and scraped vanilla bean (pod). Pipe or spoon the cream onto the tartlet bases. Bake in the oven at 150°C for 5 to 6 minutes, until the cream is set. Leave to cool. Sprinkle the edges of the tartlets with gold powder and unrefined cane sugar and caramelize with a blow torch. Bring the cream, half the sugar, lemon juice and peel, mint and butter to the boil. Strain through a china cap sieve. Whisk the 2 eggs, remaining sugar and flan powder in a bowl, then add the remaining 3 eggs and mix well. Pour a third of the hot lemon and mint liquid onto the combined eggs/sugar/flan powder, mixing well. Pour the whole mixture back into the saucepan and cook over low heat, whisking continuously, until the cream thickens. Boil for 1 minute, stirring continuously (see the technique for preparing pastry cream). Leave to cool then transfer to a pastry bag. Pipe the mixture into the tartlets until half filled, refrigerate. Cut the strawberries into quarters and the cherries in half. Position the red berries on the tartlets. Prepare the caramelized pistachios: Caramelize the pistachios and sugar in a saucepan. Pour onto a baking sheet, leave to cool and chop. If desired, you can add an extra decorative element by sprinkling a raspberry with powdered sugar.